" And there was all this BOOTY ... just Booty everywhere! " Media critic and pundit, Paul Porter says TV One's coverage of the DNC convention can be summed up in two words -- Gluteus Maximus. TV One's "After Party" analysis of Michelle Obama rear end by Michael Eric Dyson, lacked class while lowering the low standard for television news. Dyson's admiration for Michelle Obama's figure was off base and deserves an apology from TV One and the Georgetown University professor. It's tough enough trudging through opinion based biases on a daily level with pundits and analyst, Dyson has officially added sexism to mainstream media's divorce of discussing real issues. 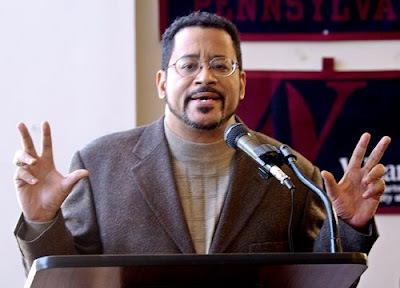 Michael Eric Dyson's referenced a recent trip to Europe, by labeling European women with flat rear ends and was proud to see Michelle Obama's, "gluteus maximus" as a symbol of the beauty of African American women. Education and common sense are obviously two distinct values and Dyson's comments are living proof.